Callers are being charged up to £5.68 just to get one number from Britain’s biggest directory inquiry service. The extraordinary cost is a result of sneak price hikes by all the main telecoms companies. Earlier this month BT, Sky and Virgin all quietly made huge increases to the minimum charge for calling the 118 118 service – taking it from £3.58 to £4.45. But TalkTalk went even further – increasing the minimum fee by 45 per cent from £3.92 to £5.68. Mobile phone companies have also introduced rises over the past year – meaning that from some networks, a 10-minute call to the 118 118 service, followed by a connection to a number, can cost as much as £50. The charges fly in the face of promises made by the Government’s telecom watchdogs when the single 192 system, which cost 40p, was scrapped in 2003. At the time, the public was promised that competition would deliver low prices and better services. In reality, it has been a disaster – with foreign call centre workers confused by requests and customers feeling cheated by high prices. The number of calls to directory inquiries has fallen by an estimated 80 per cent in ten years. But while younger people switched to free internet services on smartphones and tablets, many elderly people still rely on directory inquiries. Citizens Advice Chief Executive Gillian Guy described the situation as unacceptable. ‘People without access to the internet, who are often elderly, are particularly at risk from this type of steep, hidden charge,’ she said. Telecoms expert John Lewis, the managing director of Simunix, which runs its own service on 118 365, said rivals are pulling the wool over people’s eyes by failing to make their prices clear. He said the price of calling his service had remained virtually the same since 2003, except for an increase linked to the rise in VAT to 20 per cent, which took it to 51p. ‘The figures are scandalous,’ he said. ‘When the deregulation began it was always considered essential that prices should be displayed clearly wherever you show your number. But that has gone by the wayside. The income from the high charges is split between the firms providing the directory inquiry services and the landline or mobile phone networks customers are signed up to. 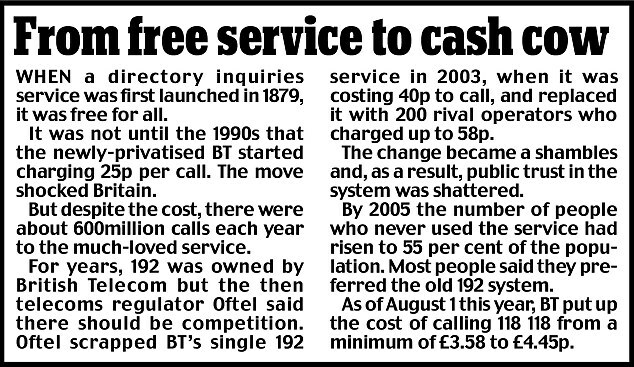 The market is dominated by 118 118 – operated by a company called The Number – and BT’s 118 500. In April, 118 118 was fined £80,000 by watchdogs after some of its advertisements failed to warn customers about the high cost of using its service. Two months earlier, BT was fined £225,000 and ordered to pay refunds to customers over what was described as a ‘disgraceful’ directory inquiry rip-off. Tens of thousands of people are thought to have been overcharged because the firm failed to make call costs clear and kept them hanging on the line with rambling automated messages. In one case a customer calling its 118 500 number was charged £81, while one elderly person appears to have been charged as much as £454 over three months. BT, Sky and Virgin all blame rises on the service provider, while BT added that it took only a small fraction of the charge. TalkTalk also blamed 118 118, but was unable to explain why its minimum fee was so much higher.